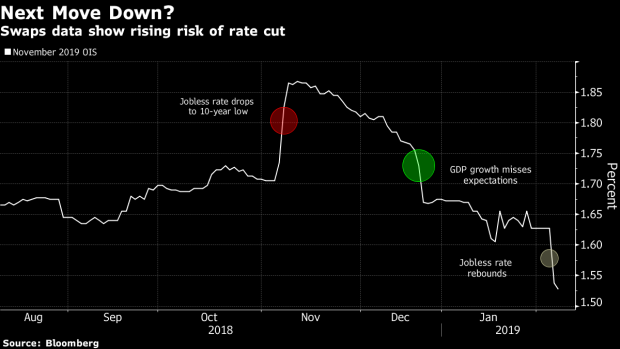 (Bloomberg) -- New Zealand’s central bank may acknowledge the rising risk of an interest-rate cut when it delivers its first policy decision of the year. While Governor Adrian Orr is expected to hold the official cash rate at a record-low 1.75 percent on Wednesday and signal no change for some time, he could concede there’s an increasing possibility of looser policy as global growth concerns mount. Traders have ramped up bets on a rate cut and are now pricing a 90 percent chance of one by November, swaps data show. The RBNZ will publish its decision at the new time of 2 p.m. in Wellington as it prepares for the formal introduction of an enlarged policy committee later this year. Orr holds a press conference an hour later. Globally, central banks are growing more wary of raising rates amid slower expansion and risks such as the U.S.-China trade dispute and Brexit. The U.S. Federal Reserve has paused its rate increases, while Australia’s Reserve Bank this month abandoned its tightening bias as a slumping property market damped the inflation outlook. The RBNZ may follow suit after New Zealand’s economy slowed in the second half of last year, jobs growth stuttered and the housing market cooled. The nation’s benchmark 10-year bond yield dropped to a record low of 2.08 percent last week, leading an Asian bond rally as investors turn to less risky assets. While the RBNZ is unlikely to adopt an explicit easing bias, economists think it may move to a neutral stance by pushing its forecasts for higher rates further out into the future. Westpac Banking Corp. chief New Zealand economist Dominick Stephens said he expects the RBNZ’s new OCR forecast to be flat through mid-2021. In November, the central bank projected rates would start to rise from the third quarter of 2020. Westpac itself forecasts no change in rates until 2022. Kiwibank chief economist Jarrod Kerr went further. ANZ’s Zollner, who is already forecasting the RBNZ will cut rates in November, said there’s no urgency for the bank to alter its stance because inflation is near its 2 percent target and the economy continues to grow.